Fusion is commonly identified as the union of two distinct dental sprouts which occurs in any stage of the dental organ. They are joined by the dentine; pulp chambers and canals may be linked or separated depending on the developmental stage when the union occurs. This process involves epithelial and mesenchymal germ layers resulting in irregular tooth morphology (1). Moreover, the number of teeth in the dental arch is less than normal. A review of the literature reveals great difficulty in correctly differentiating fusion and gemination. For a differential diagnosis between these anomalies, the dentist must carry out a highly judicious radiographic and clinical examination. The aetiology of fusion is still unknown, but the influence of pressure or physical forces producing close contact between two developing teeth has been reported as one possible cause (2). Genetic predisposition and racial differences have also been reported as contributing factors. This anatomic irregularity occurs more often in the deciduous than in the permanent dentition. 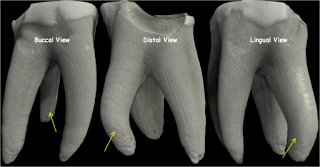 Only a few cases of fusion involving molar and premolar teeth have been reported (3-5) whereas, in both dentitions, the prevalence is higher in the anterior region (6-9). Cases of bilateral fusion are less frequent than unilateral fusion (6). Turell and Zmener (3) described a case of fusion involving a mandibular third molar and fourth molar (distomolar). Unfortunately, most of these fusions require surgical removal because of their abnormal morphology and excessive mesiodistal width, which cause problems with spacing, alignment and function (6,8). In the anterior region this anomaly also causes an unpleasant aesthetic tooth shape due to the irregular morphology. These teeth also tend to be greatly predisposed to caries and periodontal disease and, in some cases, endodontic treatment is very complicated (7,10). Fusion can occur between teeth of the same dentition or mixed dentitions, and between normal and supernumerary teeth (3,7-9,11,12). In these cases, the number of teeth in the dental arch is also normal and differentiation from gemination is clinically difficult or impossible. A diagnostic consideration, but not a set rule, is that supernumerary teeth are often slightly aberrant and present a cone-shaped clinical appearance. Thus, fusion between a supernumerary normal tooth will generally show differences in the two halves of the joined crown. However, in gemination cases the two halves of the joined crown are commonly mirror images. Fused teeth usually present asymptomatically. 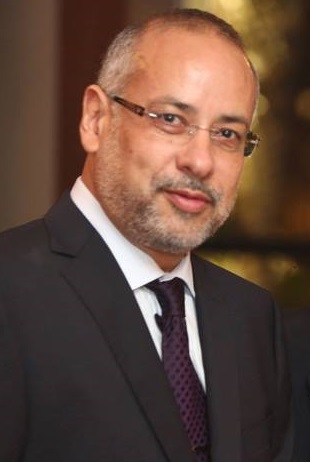 In fact, the co-operation of practitioners with expertise in multiple areas of dentistry is important to create or achieve functional and esthetic success in these cases. Several treatment methods have been described in the literature with respect to the different types and morphological variations of fused teeth, including endodontic, restorative, surgical, periodontal and/or orthodontic treatment (3-9,12). (Source: Nunes et al. 2002. Full text). 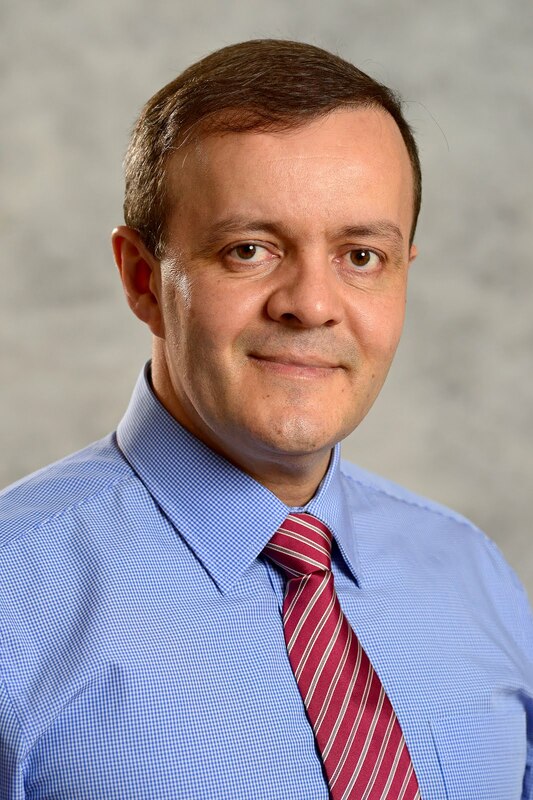 View more presentations from Prof. Marco Versiani. 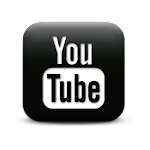 The Video Files category includes a wide range of video formats, which use different codecs to encode and compress video data. 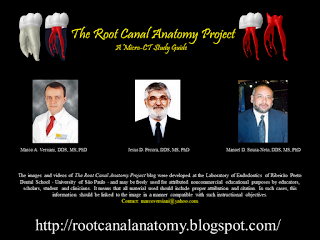 Until now, the Root Canal Anatomy Project has provided their users with only .WMV extension which is a Windows-based format (http://www.fileinfo.com/extension/wmv). Considering the arising of popular devices that use different video formats, the Root Canal Anatomy Project is starting to provide our users with formats compatible with them. 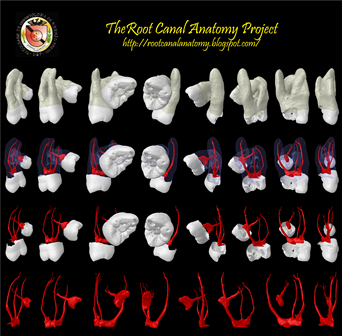 Click on the below links to download the videos of the root canal anatomy of all teeth from the mandibular and maxillary archs converted to different formats. Enjoy! 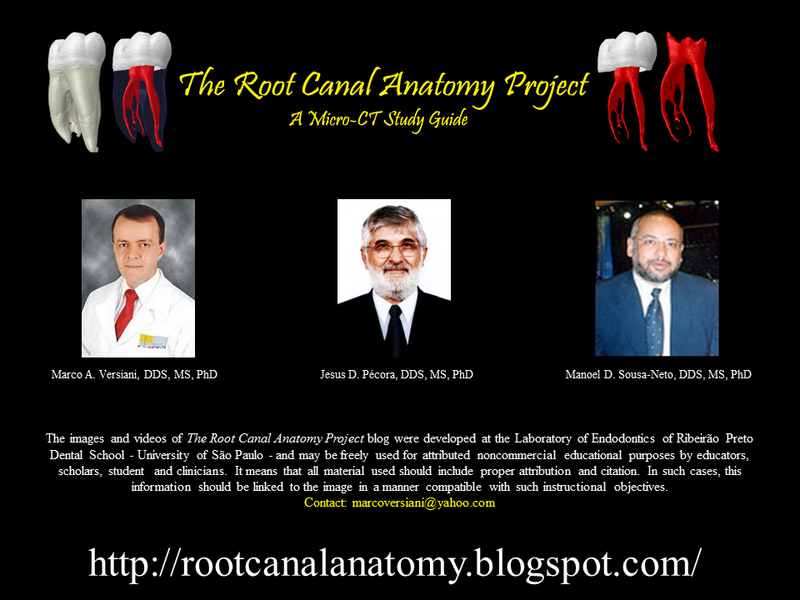 Considering some requests, the Root Canal Anatomy Project is providing presentations in unlocked, editable PowerPoint (.pptx) files with all images and videos developed during the last year in our laboratory. Just click the link and download the file (how to download a file?). It is ready to be used. Have fun! Mandibular molars can have an additional root located lingually (the radix entomolaris) or buccally (the radix paramolaris). The presence of a separate RE in the first mandibular molar is associated with certain ethnic groups. In African populations a maximum frequency of 3% is found, while in Eurasian and Indian populations the frequency is less than 5%. In populations with Mongoloid traits (such as the Chinese, Eskimo and American Indians) reports have noted that the RE occurs with a frequency that ranges from 5% to more than 30%. Because of its high frequency in these populations, the RE is considered to be a normal morphological variant (eumorphic root morphology). In Caucasians the RE is not very common and, with a maximum frequency of 3.4 to 4.2%, is considered to be an unusual or dysmorphic root morphology. 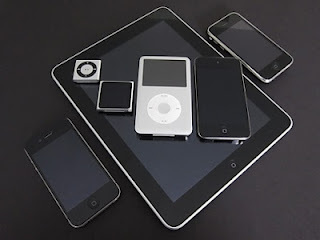 The etiology behind the formation of the RE is still unclear. In dysmorphic, supernumerary roots, its formation could be related to external factors during odontogenesis, or to penetrance of an atavistic gene or polygenetic system (atavism is the reappearance of a trait after several generations of absence). In eumorphic roots, racial genetic factors influence themore profound expression of a particular gene that results in the more pronounced phenotypic manifestation. Curzon suggested that the ‘three-rootedmolar’ trait has a high degree of genetic penetrance as its dominance was reflected in the fact that the prevalence of the trait was similar in both pure Eskimo and Eskimo/Caucasian mixes. An RE can be found on the first, second and third mandibular molar, occurring least frequently on the second molar. Some studies report a bilateral occurrence of the RE from50 to 67%. Bolk reported the occurrence of a buccally located addi tional root: the RP. This macrostructure is very rare and occurs less frequently than the RE. The prevalence of RP, as observed by Visser, was found to be 0% for the first mandibular molar, 0.5% for the second and 2% for the third molar. Other studies have, however, reported RP in first mandibular molars. The RE is located distolingually, with its coronal third completely or partially fixed to the distal root. The dimensions of the RE can vary from a short conical extension to a ‘mature’ rootwith normal length and root canal. Inmost cases the pulpal extension is radiographically visible. In general, the RE is smaller than the distobuccal and mesial roots and can be separate from, or partially fused with, the other roots. A classification by Carlsen and Alexandersen describes four different types of RE according to the location of the cervical part of the RE: types A, B, C and AC. Types A and B refer to a distally located cervical part of the RE with two normal and one normal distal root components, respectively. Type C refers to a mesially located cervical part, while type AC refers to a central location, between the distal and mesial root components. This classification allows for the identi fication of separate and nonseparate RE. In the apical two thirds of the RE, a moderate to severe mesially or distally orientated inclination can be present. In addition to this inclination, the root can be straight or curved to the lingual. 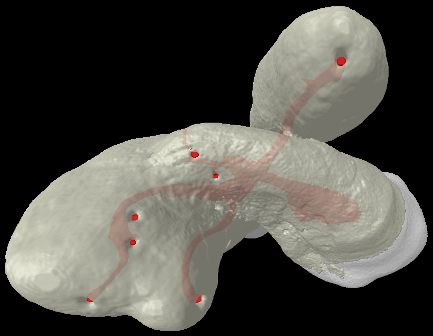 According to the classification of De Moor et al., based on the curvature of the separate RE variants in bucco-lingual orientation, three types can be identified. Type I refers to a straight root/root canal, while type II refers to an initially curved entrance which continues as a straight root/root canal. Type III refers to an initial curve in the coronal third of the root canal and a second curve beginning in the middle and continuing to the apical third. The RP is located (mesio) buccally. 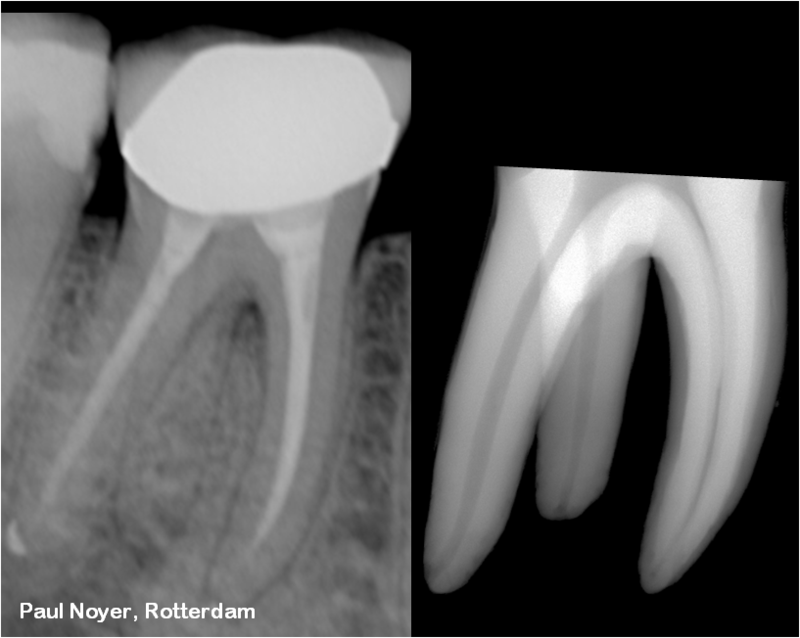 As with the RE, the dimensions of the RP can vary from a ‘mature’ root with a root canal, to a short conical extension. This additional root can be separate or nonseparate. Carlsen and Alexandersen describe two different types: types A and B. Type A refers to an RP in which the cervical part is located on the mesial root complex; type B refers to an RP in which the cervical part is located centrally, between the mesial and distal root complexes.An increased number of cusps is not necessarily related to an increased number of roots; however, an additional root is nearly always associated with an increased number of cusps, and with an increased number of root canals (From Calberson et al. 2007 JOE 33(1):58-63).